As a parent of young children in Pattaya, it’s most likely inevitable you will visit Cartoon Network Amazone at some point, however reluctant you may be. The inevitable has happened for me, along with my wife, 2 sons, and 3 of their friends, we quite literally took the plunge. And now I’m going to tell you what I think. Admission/entry prices at Cartoon Network Amazone are 1,890 baht for adults, and 1,290 baht for children. Including food set and locker. There’s a promotion running through to February 28th 2019, the above prices are reduced to 1,290 baht for adult, and 990 baht for a child. There are various group deals and promotions available on their website. 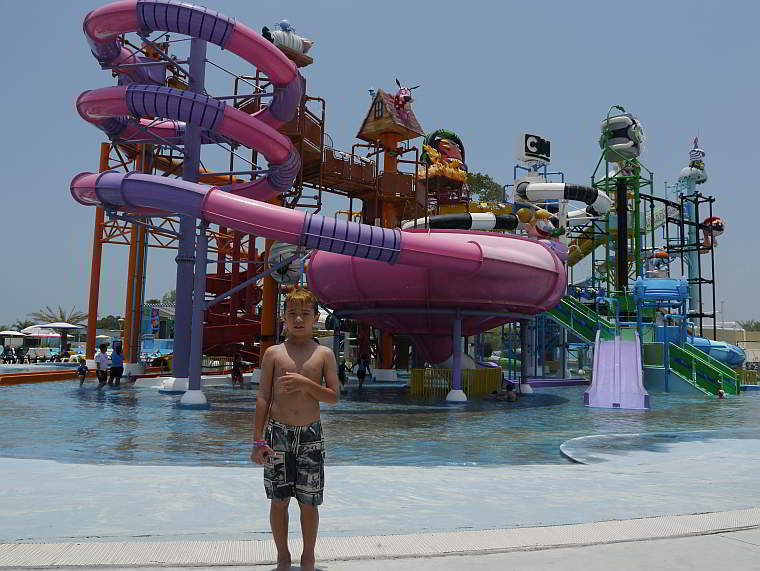 Get discounted entry/admission tickets to Cartoon Network Amazone in Pattaya. Read this Pattaya online tour and entry ticket booking guide to get the cheapest tickets to all the best attractions, activities, shows, and sightseeing tours in Pattaya. Is Cartoon Network Amazone a good day out? Is it one of the best rated things to see and do in Pattaya. 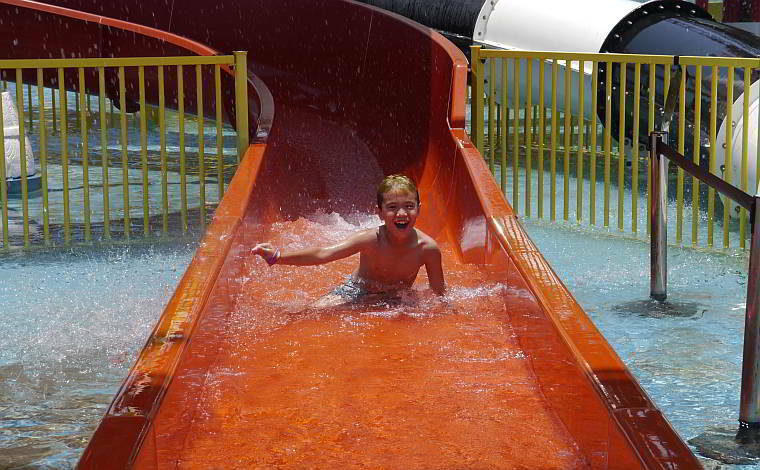 Cartoonival (photo above) is a series of slides of varying heights suitable for toddlers and young teenagers. The Omniverse Zone (photo above) and the Adventure Zone are for families and young adults. 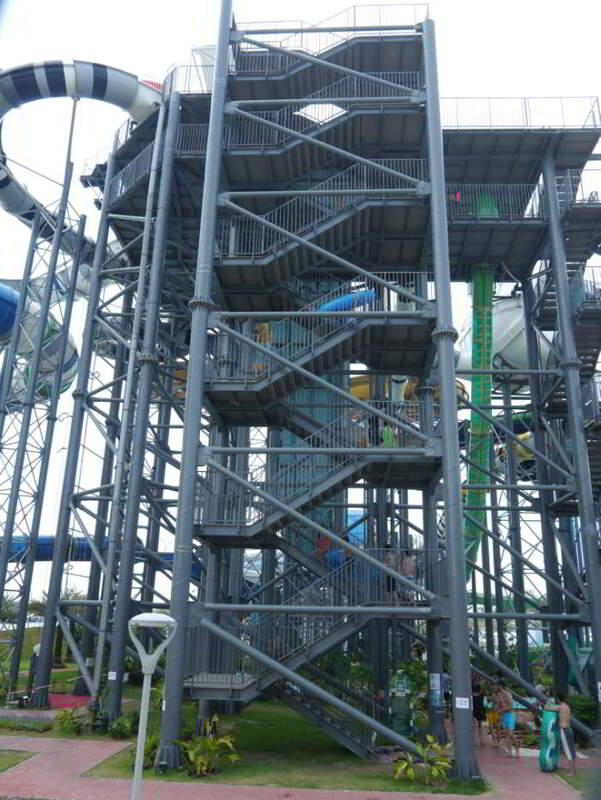 The Omniverse Zone does have some height and weight restrictions, but there are some seriously thrilling rides which children of 130 centimeters height can ride accompanied by an adult, and a few which they can ride solo. I had to do my fatherly duty, so I took my 8 year old on 2 rides, one I can’t remember the name of, the other was the Humongaslide. My son managed to keep his emotions intact, I on the other hand let out a large small scream whoop of panic of joy, on both rides. After that I was feeling a little chicken tired so I left him with his brother. Many of the Zones and rides at Cartoon Network Amazone have notices posted, warning that due to extreme forces and speeds, participants should be in good health. Well, if you can make it up the steps in the Omniverse Zone I think you can safely say you are in good health (see photo above). When the big boys played on the big rides the little fella spent his time at Cartoonival (photo above), and had a great time. At the highest point of Cartoonival is a large bucket which contains a 1000 liters of water, when it fills, it tips and sends its contents cascading down. 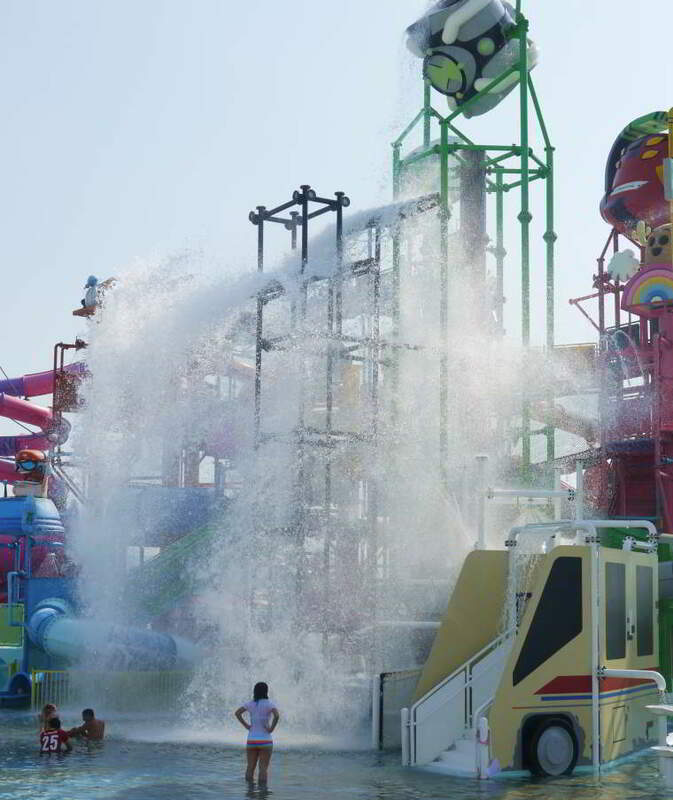 The Mega Wave pool (photo above) is great fun, every 20 minutes the wave machine is activated for around 5 minutes. Be warned, the waves are strong, and the water is deep at the farthest end, but life jackets are available, and 2 life guards are on constant watch. The Surfarena (photo above) has 2 booths side by side, great for battle with a friend. And a great place to watch some most ungraceful spills. 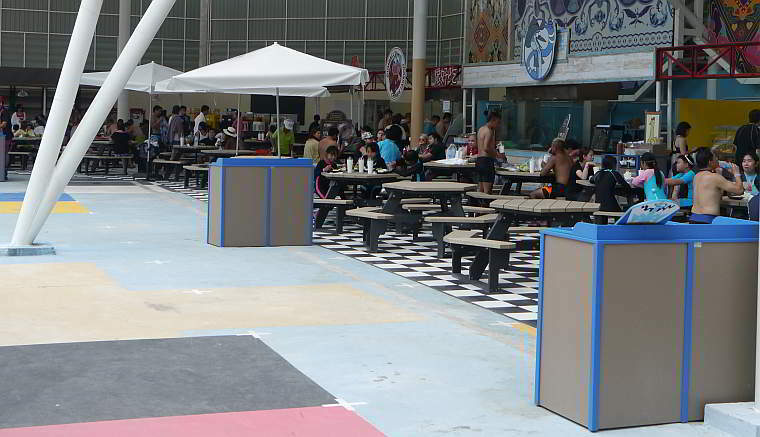 Foodville food court (photo above) is situated behind the Omniverse Zone, food, snacks and drinks are available at premium prices. Drinks are cheaper at Dexters, situated close to the entrance. No food or drinks are allowed to be taken in, and they DO check your bags as you enter. 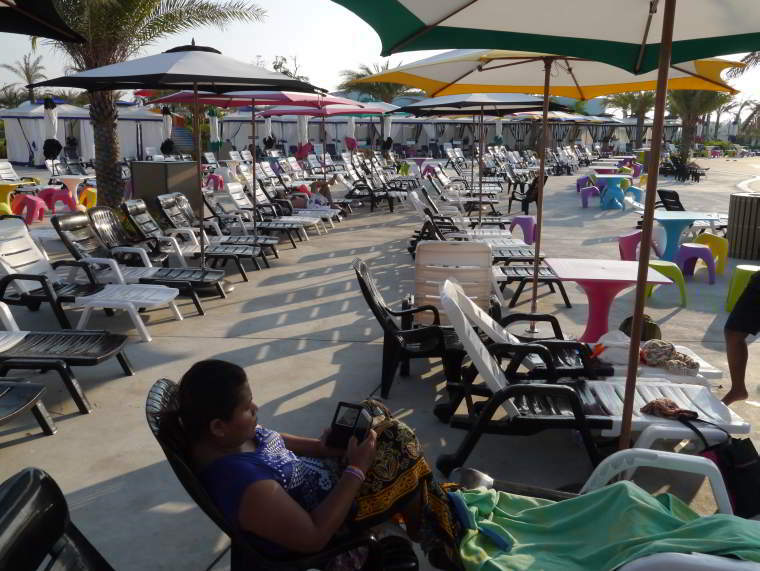 The seating is abysmal, there are a few small tables and stools, but mainly the seating is sun loungers, I hate them. The stand alone parasols do little to protect you from the sun, and you spend most of your time chasing shadows. 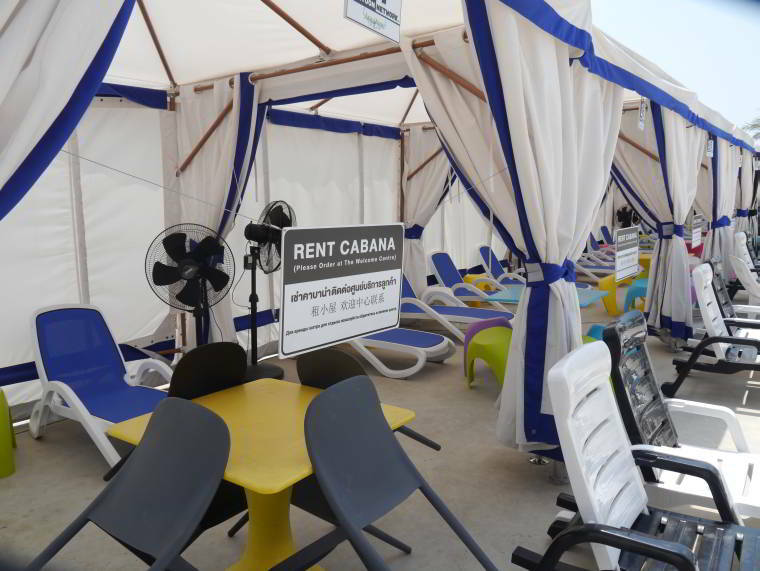 I would say these cabanas should be the standard, there’s lots of them, nice and shady, and they include a fan. I noticed only 1 or 2 were occupied, I also read a review on Tripadvisor which suggested the rental price was a minimum of 1000 baht.